Rapid prototyping is used by many different industry sectors - sometimes for concept work and at other times for small run production, which is the service RapidPro provided for Cobalt Niche who project managed the new look for the 2008 Australian Open. The redesign corresponded with the new Plexicushion playing surface installed at Vodaphone Arena. 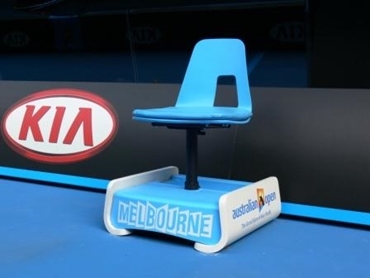 The on-court furniture was a pivotal part of this, being redesigned to give the Australian Open a more modern feel. RapidPro was approached by Cobalt Niche to manufacture a number of large key components using rapid prototyping and small run production techniques. With timing critical and the large quantity of pieces required RapidPro had to do ensure consistent quality and high output. So, multi-cavity silicon tools were used, along with custom blended polyurethane. RapidPro was also able to reduce the heat omitted at manufacture, resulting in fully functional, working prototypes.